Like most women I love anything covered in glitter or with a rhinestone or two, I also love anything that has a vintage patina! 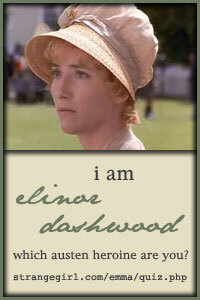 These were my inspiration for my latest pieces of jewelry and gift tags. Black Tie and Tails Upcycled Vintage Jewelry Necklace - Romantic elegance, this one of a kind repurposed jewelry Necklace was created using a large antique jet black flower button for the centerpiece; a black rose cabochon adhered to a vintage mother of pearl disc, a round vintage style rhinestone connector and accents of vintage cream faux pearls. Antique brass chain and findings, for a truly vintage look. Black Tie and Tails Rose Cabochon Mother of Pearl Earrings - Romantic set of black & white dangle earrings with an elegant little black rose cabochon set on a mother of pearl disc, accented with a clear rhinestone drop and a dark pewter gray metal mesh bow. A perfect pair of earring for your upcoming Holiday event or winter wedding! 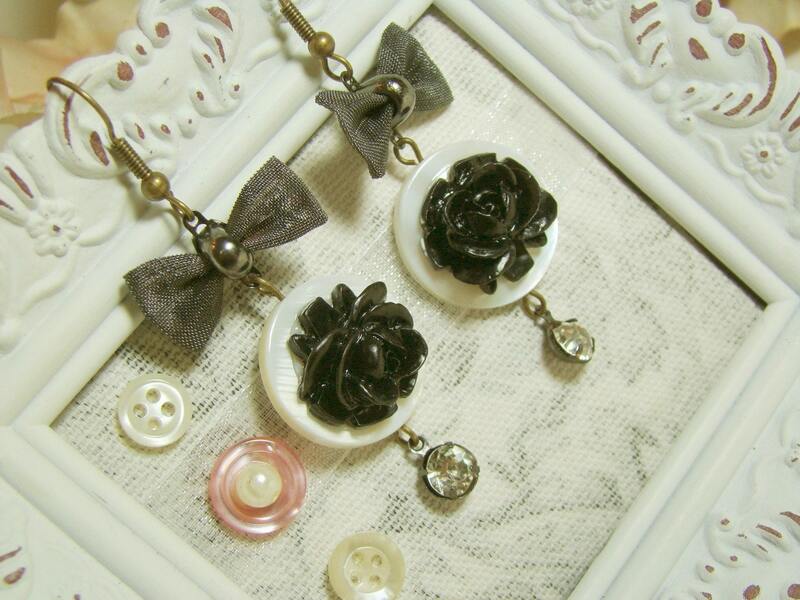 This set matches my upcycled re-purposed vintage jewelry Black Tie and Tails Necklace. 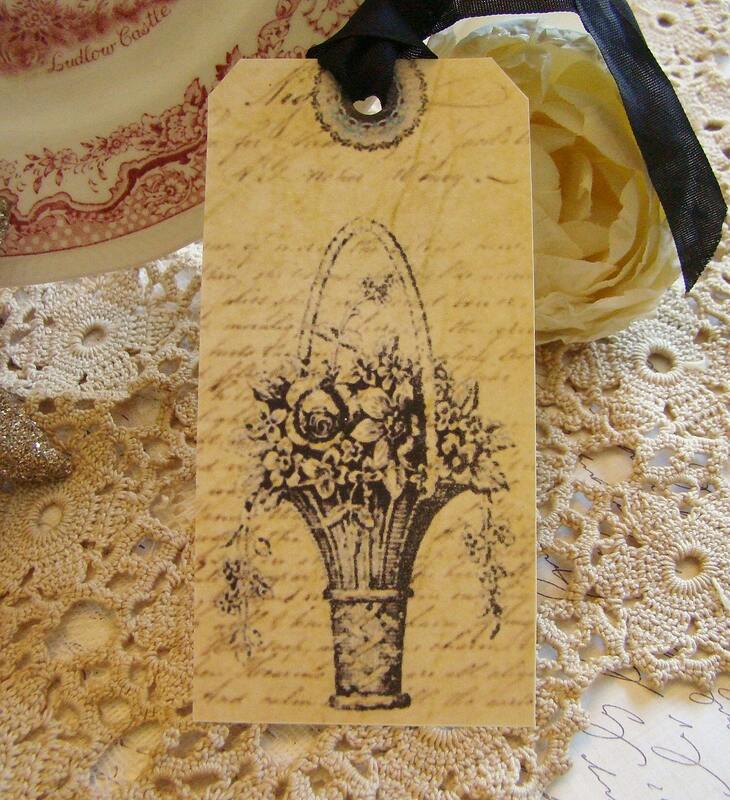 Antiqued Paris Market Flower Basket Gift Tag Set - Reminiscent of a Paris flower market, these lovely handcrafted tags of a vintage black flower basket image set on a sepia toned antique letter background. 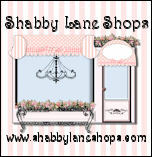 Very chic and romantic.These would be wonderful gift tags, bookmarks, invitations, cards, ornaments, or used in your French Chic, Shabby Chic or Cottage Décor. 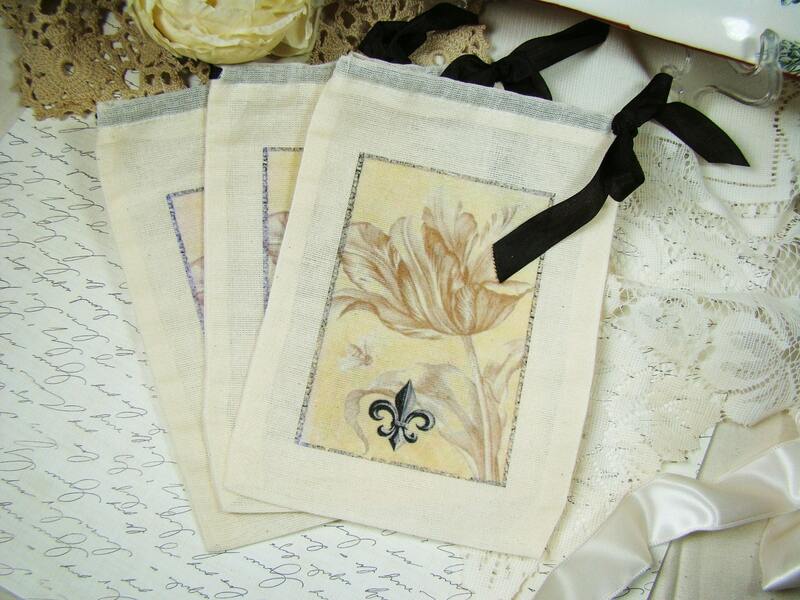 French Chic Botanical Print with Fleur de lis Muslin Bags Pouches - Elegant and eco friendly for gift giving or organization, these French Inspired bags are created with a collage of a sepia toned vintage tulip botanical print, a little French bee and accented with a black & gray Fleur de lis! Set of 3 Paris Flea Market Chic Muslin Pouches / Bags with Black Silk Ribbon drawstring. 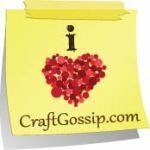 These pouches / bags are of a creamy off white muslin and measure 4 ¾” X 6 ½”. ﻿French Chic Glass Glitter Fleur de Lis Rosette - An elegant Rosette Ornament created with double layers of imported white paper and taupe imported crepe papers, edged with silver glitter and accented with snow glitter, a center scalloped medallion created with a vintage style sheet of music , all of which is the base of a wonderful hand applied vintage German silver plate glass glittered French Chic Fleur de lis! 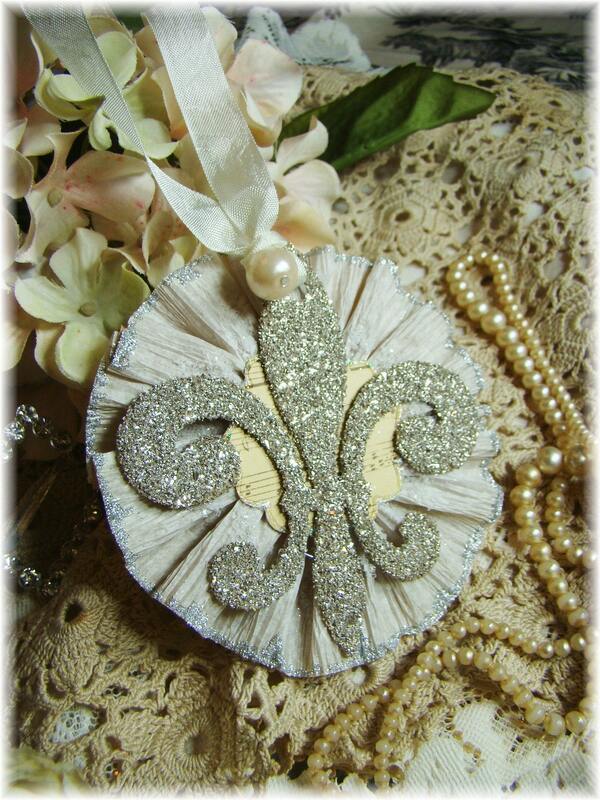 The ornament is tied with a silky cream seam binding ribbon and accented with a big cream faux pearl.